The uranium cannon shells are an advanced ammunition type for the Tank along with explosive uranium cannon shells. Once they are made available, they surpass their regular variant; their damage and piercing power is increased twofold. Since regular shells are still specifically required to manufacture uranium variants, any previously manufactured stockpile can be "upgraded" without waste. 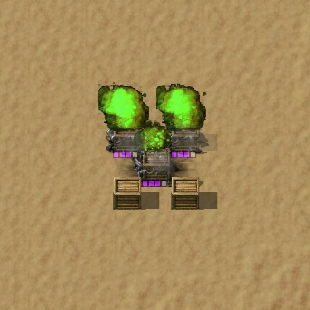 While uranium cannon shells still deal an amount of explosive damage, it is only dealt on the directly hit target and it is also a much lower amount than what explosive shells deal; its primary damage outlet is physical and therefore better suited against worms, nests and large spitters for their lesser resistances against it. These shells also feature the greatest piercing power in the game that is reliable for anything but the largest enemies, even capable of destroying two nests in one shot.